So almost every weekend for the past 2 or so years I have stayed at my boyfriends. This has given me master packing skills. Awhile back I showed you my weekend makeup essentials and thought that this would be a fun series. So here is what I packed last weekend. I have been loving my Caudalie Vinoperfect Radiance Serum. It really moisturizes my skin and leaves a radiant glow. My absolute holy grail foundation is the Dior BB Creme. It has great coverage and is such a great match for my skin tone. Since my skin has been quite oily lately so I have been setting my foundation with the Chanel Les Beige powder. This powder makes my makeup last all day long. And I love to use my Sephora #55 brush with the powder. It isn’t too dense and just picks up the right amount of powder. For blush I have been loving a good blush stick. Lately I have been enjoying the new Nars Matte Multiple in Laos. It is a nice rosy coral shade that looks great on my fair skin. I am not into the whole using my fingers so I have been using the ELF small stippling brush. It has such a small head that it works great with this product. To highlight I have been reaching for my Kevyn Aucoin Candlelight. This gives you such a beautiful lit from within glow (if that even makes sense). I have been going for a really strong brow lately so, I have been using the Maybelline Color Tattoo in matte brown (le). It has a great waxy consistency that keeps my brows in place all day. I have also been doing very minimal eye makeup, just some mascara. The Estee Lauder Sumptuous Extreme makes my lashes look so voluminous. It is just amazing! Then for lips I have been loving the YSL Gloss Volupte in Grenade Pepite. It’s a nice strawberry color that makes my lips look luscious. 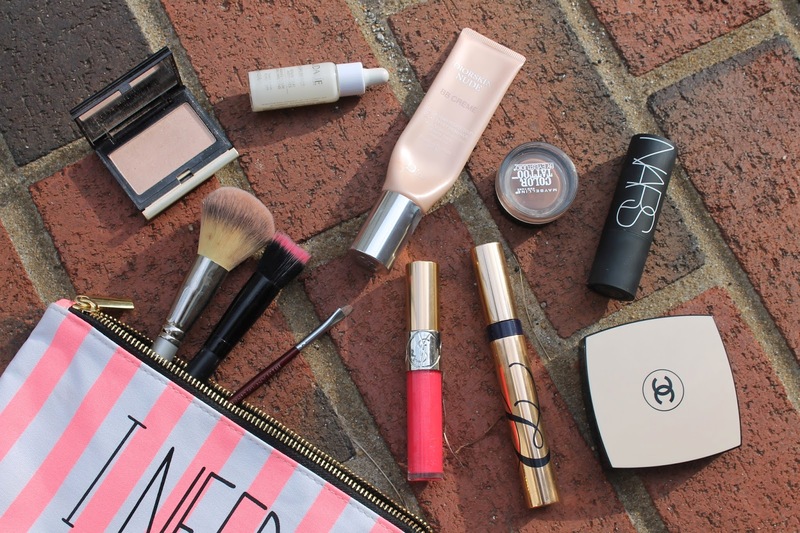 What are your weekend makeup essentials ?? Previous Post Current Wishlist ! Next Post April Favorites !